Daily life is messy, accidents happen, and time is precious. So when was the last time you got your upholstery cleaned? It is okay if it has been awhile (or maybe never, we aren’t here to judge), but now is your chance to change that. Furniture gets used and abused, whether being jumped on by kids, covered in pet hair, or simply just sitting and collecting dust. Yes, unfortunately, you could never touch a piece of furniture and it is still getting dirty! We recommended getting your upholstery cleaned annually to maintain it properly. For lighter fabric colors or rugs, it may need cleaning two or three times a year. You may be thinking that all that cleaning might wear on delicate upholstery, but it is proven to actually extend its life and it certainly improves the indoor air quality! And no, that does not mean trying to attempt to clean your own upholstery after watching DIY videos on YouTube. The fact of the matter is— professional furniture cleaners are needed to safely clean and maintain your upholstery. Don’t fret. We have proven methods to get any type of upholstery cleaned, all while protecting your furniture and making your home a happy, clean environment to live in. Wet Cleaning – The cleaning solution is sprayed onto the upholstery through a system called CFR, which stands for “Continuous Fluid Recovery”. This upholstery cleaning method allows the cleaning solution to ride the air current from our vacuum to our special tool, then through the fabric, and right back to our truck. This prevents the solution from ever soaking into the padding or stuffing material but thoroughly washes the fabric like no other systems can! The CFR system recovers over 97.5% of the cleaning fluid which minimizes drying time, thus minimizing down time. This wet cleaning process is the most effective at removing soil and restoring your fabrics to a like new condition. Dry Cleaning – Although the name says “dry” cleaning, this method actually uses a liquid cleaning agent like odorless mineral spirits (OMS). This is called dry cleaning because it uses a waterless (dry) solvent. The process is very similar to the wet cleaning process other than the solution. Dry Cleaning has limited use today due to its inability to remove spots and soils. Leather Cleaning – This method is much like waxing a car and it takes a little longer than the fabric cleaning methods. Variations occur based on the exact type of leather. “Protected” leather is very cleanable and allows for the best results. “Aniline” leather is also very cleanable and the results are great, with a few limitations such as pet stains. “Nubuck” leather is the least cleanable type of leather. If you have any questions on the type of leather you own and how it can be cleaned, don’t hesitate to ask us! Depending on the type of material being cleaned, our procedures vary. 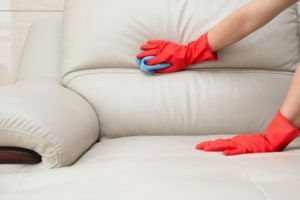 Guaranteed Clean is unique because we take special precautions to clean your upholstery and furniture in the most effective and safe way possible! We guarantee we can clean even the most difficult fabrics. Prior to every cleaning, we test the upholstery’s color and fiber type. We want to be absolutely sure we never damage your furniture. Color tests are done to guarantee that the solution does not damage or affect the color of the upholstery. Fiber tests are done because often time fabrics are made of multiple fibers, especially in upholstery. These different fibers can react differently to cleaning solutions, so we determine what the fiber content is and base our cleaning off of the weakest fiber. For example, cotton is usually one of the weakest fibers, so if your fabric contains any cotton, we use special, delicate chemicals and take precautions such as implementing quick drying methods. Speaking of quick drying methods, we always speed dry cushions. After completing the most thorough and safest cleaning process, we speed dry your cushions. Part of cleaning upholstery is always being mindful of your time, and dry time is always a calculated factor. In addition, we always take special precautions to protect the floor and other furnishings while we clean. We create our “Cleaning Area” so that everything is protected. An important aspect of the cleaning area is the drying mat. We place a furniture blanket on the floor and place an air mover to blow air across the surface. As each cushion is cleaned, it is placed on the drying mat and rotated until it is dry. Big Red’s Guaranteed Clean can clean your upholstery no matter the level of difficulty. Extend the life of your furniture and even your oriental rugs and schedule a cleaning today!